Experience the thrill of swimming with dolphins and sharks while exploring the pristine waters of the Caribbean Sea when you take part in the Dolphin Royal Swim VIP Plus program in Cancun. You will discover the incredible world of local marine mammals and have the chance to learn about their environment. Explore the amazing marine world of the Isla Mujeres Cancun when you experience the Sea Life Discovery Plus tour in Cancun. The Royal Swim program gives you the chance to see marine mammals like Sea Lions, Manatees and Dolphins while swimming alongside them in the pristine blue waters of the Caribbean. 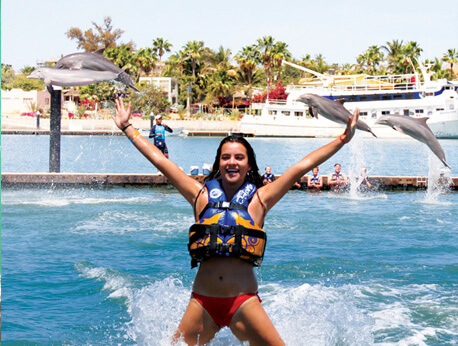 The Dolphin Royal Swim program lets you swim with dolphins and experience these majestic animals like never before. While on the dolphin tour, you’ll be charmed by the dolphin’s amazing ability to express their playful personality. Some things you can expect to see while on your dolphin portion of your tour are a handshake, foot push, dorsal tow, and hand targeting. The famous foot push involves two dolphins jolting you forward by each using their snout to push the bottoms of your feet. Getting towed through the pool on the dolphin’s dorsal fin on the dorsal tow will surely be an additional highlight in your package. Your time with the marine mammals includes getting close to sea lions and manatees while learning about their environment, temperament, and eating habits. Experience the antics of the sea lions and dolphins as they perform tricks for you like flipping through the air and several other exciting feats. You will also have the opportunity to go snorkeling next to sharks during your Swim VIP Plus program. This particular program includes a continental breakfast before your swimming activity and access to the beach club with amenities like a swimming pool, beach chairs, towels and lockers. During your trip to Cancun, you can enjoy other activities around the area, including local restaurants, cafes, shops and more. The Dolphin Royal Swim program requires children 8-12 years old to be accompanied by an adult while kids 13 and older can swim alone. It is recommended that you bring your own biodegradable sunscreen, a personal towel, and cash. If you have any health concerns, please contact the Dolphin Royal Swim call center for further details and information regarding requirements for swimming with the mammals.